Jordyn Richter earned her Masters of Science in Occupational Therapy from the University of Mary in Bismarck. Jordyn's previous work experience includes working in Early Intervention with children 0-3 on gross and fine motor skills, sensory integration and self-help skills. 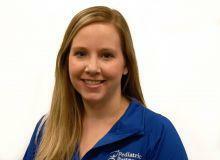 Her areas of interest include primitive reflexes, social emotional skills, motor delays and infants. Jordyn is certified in PECS 1 and CPR.